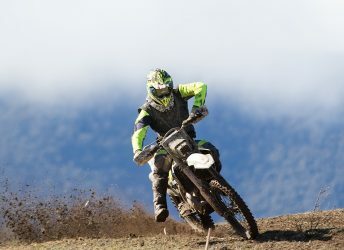 The 2017 Yamaha Australian Off-Road Championship (AORC) Junior competitors were the first to compete on the 16 kilometer circuit in Cross Country format this morning. Racing lived up to all expectations with exciting battles up front with Joshua Brierley and Corey Hammond being the highlight. Winners for the Junior classes included Brierley, Jayden Rudd and Wil Riordan. With all Junior championship classes still (mathematically) in the running heading into Rounds 11 & 12, this weekend is absolutely vital for competitors to seal their respective titles. Two Junior Championship titles were claimed today. Joshua Brierley managed to pull enough of a gap to his brother in J4, clenching honors. Jayden Rudd also managed to win his championship by scoring enough points to put the title out of reach for Ned Chapman. Husqvarna rider, Joshua Brierley was on top of his game today crossing the finish line first. After managing the sensational win, Brierley was declared J4 class champion. The focus of the race was an epic battle between Brierley and KTM mounted rider Hammond that raged until the final lap where, Brierley managed a last gasp overtake, to win in style. Only one second separated the duo as they crossed the line. Brierley taking 2:04:37.328 and Hammond a 2:04:38.678, to complete the Cross Country circulation. Completing the podium positions was Joshua’s brother, Mitchell Brierley. (Mitchell) Brierley took only 2:05:58.085 to finish the Omeo course, a further 80 seconds behind the two J2 class leaders. KTM mounted Jayden Rudd, sensationally has taken out the 2017 J3 title by taking the Round 11 win! Given this is only Rudd’s first full year in the AORC, winning a championship first time out is extremely impressive. Rudd finished with a total time of 2:08:37.538. Husqvarna rider Matthew Pye was Rudd’s closest challenger; his time was a 2:13:24.076. The difference between Rudd and Pye was 247 seconds. Sam Barton impressed to finish third on his Yamaha machine. Barton finished a further 156 seconds behind Pye with his total accumulated Cross Country time being a 2:16:00.763. KTM mounted rider, Wil Riordan was once again the standout performer of the J2 class. With the J2 championship going down to the wire between Riordan and Kyron Bacon, the victory now gives Riordan a handy championship buffer heading into the final round tomorrow. Riordan finished the race with a total time of 2:10:45.581. Honda rider Kyron Bacon after winning both races back at Rounds 9 & 10 at Kyogle (NSW), found himself on the back foot today, finishing in second position. Bacon finished only 12 seconds behind after he took 2:10:57.341 to finish the race. The final podium place getter was Angus Riordan. (Angus) Riordan on his KTM finished 148 seconds behind with his time of 2:13:25.272.